Built in 1894 with funds from the Commonwealth of Massachusetts, Stratton Hall was the original home of WPI's Mechanical Engineering Department. It was named for Charles G. Stratton, a member of WPI's Class of 1875 who served as a trustee and president of the Alumni Association. After the Mechanical Engineering Department moved to Higgins Labs in 1942, the building served as quarters for Navy seamen who were part of the Navy’s wartime V-12 training program, which continued until June 1946. 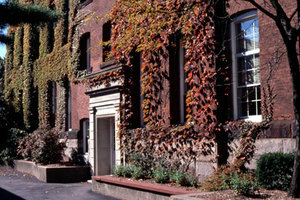 Today, Stratton houses the Department of Mathematical Sciences. The state-of-the art Maple Lab is located on the basement/ground floor in room 003, which features several high-performance computer workstations running mathematics and analytical software. Stratton is also home to the Center for Industrial Mathematics and Statistics, a resource that supports industrial collaborations with over 30 companies, businesses, and government labs. Mathematical Sciences - Analysis and PDE Seminar - Ryan Alvarado, (Amherst College) "From lower measure bound to Sobolev embedding and back again"
Mathematical Sciences - Colloquium - Yousef Marzouk, (MIT) "Nonlinear filtering and smoothing with transport maps"